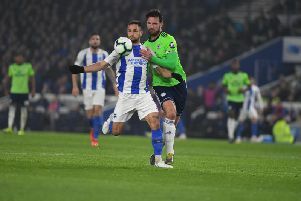 Albion are set to make their first new signing of the close season, bringing in German midfielder Pascal Gross from FC Ingolstadt 04. The 25-year-old has agreed a four-year contract with Albion, and will officially join when the transfer window reopens for an undisclosed fee, subject to international clearance. He has made close to 200 appearances in the top two tiers of the Bundesliga; Gross, who has played for Germany at under-19 and under-18 level, is a real favourite among the Ingolstadt fans, and has been their standout player over the past two seasons. Brighton manager Chris Hughton said: "We are delighted that Pascal has opted to sign for us, amid interest from a number of clubs from the Premier League and across Europe, and I am pleased to welcome him to the club. Born in Mannheim, Gross began his career with Hoffenheim in 2008, before switching to Karlsruhe in 2011; he moved to Ingolstadt in 2012. He will play his farewell game for Ingolstadt this weekend, when they entertain Schalke in their final match of the season on Saturday.